A specific blue ribbon, in fact, the Cordon Bleu. And today, April 4, 2013, happens to be Le Cordon Bleu Day. Now, you might think this is in honor of the famous French culinary school, hence mentioning it today, but that was a later development. What we see as the ultimate prize, was merely the color of ribbon (probably signifying fidelity and purity, all things considered) that the Order of the Knights of the Holy Spirit used to hang their talisman with back in the 16th century. Over time the blue ribbon came to signify the best of the best. If you did want to make Chicken Cordon Bleu (no relation to the culinary school, either, it seems to be a mid-century American invention), it’s not so difficult as the name might make it sound. This version by Tyler Florence over on FoodNetwork.com looks likely enough. Of course you can find illustrated instructions on How to Flatten Chicken Breast on page 105 of What to Feed Your Raiding Party. 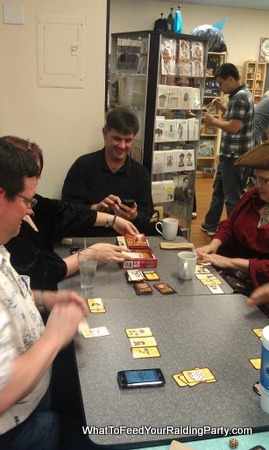 Did you attend any special events for International Tabletop Day this past weekend? 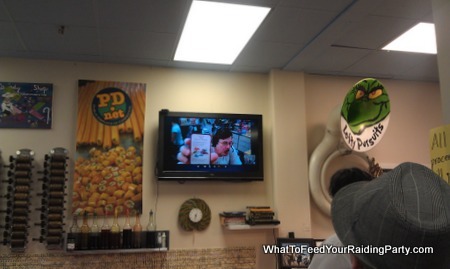 While we didn’t make the full day’s schedule (and so missed out on the Geek & Sundry Skype chat with Felicia Day) at our local game shop, Lofty Pursuits, we did make it to the evening portion just in time for the remote chat with Steve Jackson. Of course, after that we had to partake in both ice cream and a game of Munchkin–it was only fitting! Lyssa had come dressed in pirate garb so we opted to play her newly acquired copy of Munchkin Booty, just to be different. It came down rather narrowly to Todd or I winning. Part of me thinks that the only reason Todd won was because they’d expended all their dirty tricks defeating me (though just barely, I might add!). Of course that -10 to Davy Jones and the doubling card certainly came in handy, too. The next day was Easter, which is pretty low-key in our house. We did absolutely nothing festive except eat Peeps. 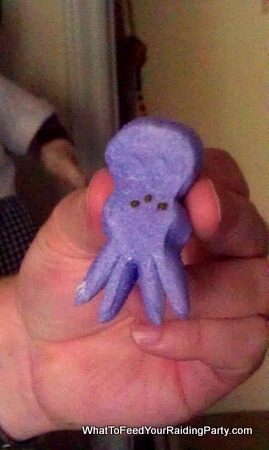 And at some point that evening Todd came in with his version of Peepthulu. Talk about sugar causing problems! He was dispatched in short order. To finish off this random round-up, do you happen to know what this is? Your eyes (and tastebuds) may well deceive you! 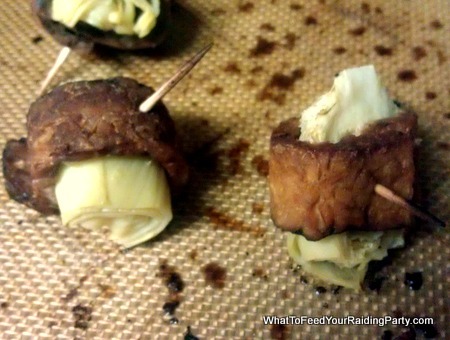 It looks like Bacon-Wrapped Artichoke Hearts, doesn’t it? Well, it’s not. What you see is actually Fakin’-Wrapped Artichoke Hearts, a vegan substitute for our much-loved appetizer. Does it taste exactly the same? No. Is it still pretty tasty and does it get the job done? Yes. In fact, with this bacon-style tempeh version you actually taste more of the artichoke hearts. Also, while the original are perfectly tasty at room temperature or even cold, even I admit that the cooling bacon grease leaves something to be desired; the “fakon” does not suffer the same fate, I’m happy to report, and they even seem to taste better after a bit of a chill. Go figure. Work is obviously proceeding on the RPSS (Raiding Party Substitutions Supplement). I have absolutely no hope of it being ready in time for ALTCon on April 13, but I’ll keep you all posted as work continues. The bacon element was one of the more challenging substitutions to tackle, you know. For those wondering, the supplement will be available as a free download when complete, and I’ll probably have printed copies available at conventions for a nominal fee (enough to cover copying fees).